Many of Madrid’s historic buildings and fountains have this week been lit up as part of the celebrations for the Royal Wedding on the 22nd May. They include the Prado, Cibeles and Neptune fountains and the Puerta de Alcalá. For the day of the wedding these lights will be taken down and floral decorations will take their place in preparation for the Royal procession. If you live outside Spain, you might be able to pick up transmission on satellite or cable. Sky, in the UK, transmits TVE International which will televise the whole of the wedding. I just stumbled across a section on the Ayuntamiento de Madrid‘s (City Council) website, which gives visitors virtual tours of some of the city’s famous monuments and buildings. They include: Templo de Debod, Teatro Español, Puerta de Alcalá, Casa de la Villa, Casa de Vacas and Centro Cultural de la Villa. In most cases you will need to click: ‘ACCEDER A LA VISITA VIRTUAL’, though some require ‘QuickTime’. On some of the screens you will need to use the keyboard to rotate or zoom in on images – here are the translations: ACERCAR: Pulsar MAYUSCULAS (to go near turn on Caps Lock) | ALEJAR: pulsar CONTROL (to zoom out, hold the Control button). To move right and left, click on the image and hold, then move left, right, above or below. Set on the western side of the city, the Templo de Debod is one of the most unlikely structures that you would expect to find in the capital. The temple is over 2,200 years old and was given to Spain as a sign of gratitude by the Egyptian government in 1968 – Spain having given assistance to Egypt in helping to rescue the temple of Abu Simbel in Namibia. The temple was dedicated to the god Amón. Entrance to the temple is free and the best way to get to the temple is from metro Plaza de España. The temple is particularly beautiful at sunset and affords views out to the vast Casa de Campo. I would suggest taking a stroll along the smart Paseo Pintor Rosales, which runs next to the Parque del Oeste, and where during the summer you will find ‘terrazas’ or street cafes/bars. The ‘Teleférico‘ (cable car) is also located on this stretch. The Almudena Cathedral, situated next to the Royal Palace, took well over a 100 years to complete. It was finally consecrated by Pope John Paul on the 15th June, 1993. Five days before the consecration of the cathedral the statue of Our Lady of La Almudena, patron saint of Madrid, was moved from San Isidro church to here. The Almudena will be the place where the King’s son, Felipe, will get married this summer. The Christmas Market, held in the Plaza Mayor, will be officially inaugurated on the 5th December, though stalls will start selling from the 28th November. The market comprises many stalls that sell all sorts of Christmas goods, from tinsel and Christmas trees to wonderful nativity scenes. This year the market stalls will be placed along the 4 sides of the Plaza Mayor, the idea being to create a plaza within a plaza. Look out for the posters, designed by the artist Delia Piccirili, which will adorn the ends of the stalls and which depict “Christmas in Madrid”. This year there will be two large nativity scenes on display, one by the artist José Luis Mayo and the other given by the Comunidad de Murcia. The municipal organisations will try to make sure that all Christmas lighting is consistent all over the city and have enlisted the help of traders across the city. The fountain of Cibeles is to be found on the stretch of Madrid commonly called the Paseo de Recoletos. It depicts the goddess Cibeles, the Greek goddess of fertility, who is seen sitting on a chariot and being pulled by two lions. On one side of the fountain of Cibeles, the Paseo de la Recoletos starts, heading north to join up with the Paseo de la Castellana. On the other side, the Paseo del Prado begins and heads off south, towards the fountain of Neptune, in the Plaza de Cánovas del Castillo, and on until Atocha. 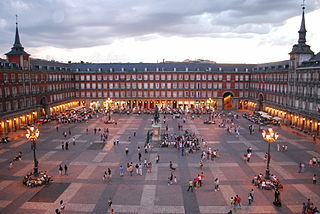 The principal square in Madrid is the Plaza Mayor, which is south west of the Puerta del Sol. Built between 1617 and 1619, and restored in 1790 after a fire, it is in a part of the city known as “Madrid de los Austrias” (the Hapsburg monarchs having built it. ), or what I prefer to call “Old Madrid”. It is probably one of the finest plazas in Spain, though Salamanca comes a close second (that’ll upset some people!). The centre of the square is occupied by a statue of Philip III who was responsible for the construction of the square. The Plaza Mayor was once the focal point of the old city, where bullfights, royal coronations and even the inquisition took place. Nothing beats Sunday afternoon in Retiro Park. Situated behind the Prado museum, it is the most popular and widely visited park in Madrid. On a Sunday afternoon you will see Madrileños walking with their families in the park and being entertained by the multitude of street entertainers. Retiro is also a central meeting point for all sorts of people, from the roller skating youngsters and older men playing ‘petanca’ (boules) to football players and joggers of all ages. Please let me know if you have any favourites you could add to this list. Puerta del Sol is one of the most important of Madrid’s squares. It is the place where young people meet; where people stop off to go to the Plaza Mayor and old Madrid; a place to shop in department and smaller stores and on 31st December, the New Year is brought in to the chimes of the Puerta del Sol clock.